I call this Vegetarian Tortilla Soup recipe a tortilla soup, but I really don’t put very many tortillas in it, largely to keep it lower carb. This is easy with the Chicken Tortilla Soup, but once you add black beans and corn, it’s not low-carb anymore, so just be aware of that. This soup is made in quite the same fashion as the chicken tortilla soup recipe. One thing to be aware of is that cooking the beans within the same broth does cause the broth to darken. It still tastes amazing, but if you want a redder broth, you may need to cook the black beans separately. Me, I don’t care what it looks like. I want it to be authentic, and easy. This is easy. There’s really only one manual step, but this one is an important one. It’s essential to sauté the vegetables until they thicken. This will take at most 10 minutes, but will add a world of flavor to your soup. Looking for more delicious vegetarian dishes? Check out my Spicy Cauliflower Soup! It’s vegetarian, low carb, and absolutely delicious! Another great vegetarian soup recipe is my Indian Dal Soup. 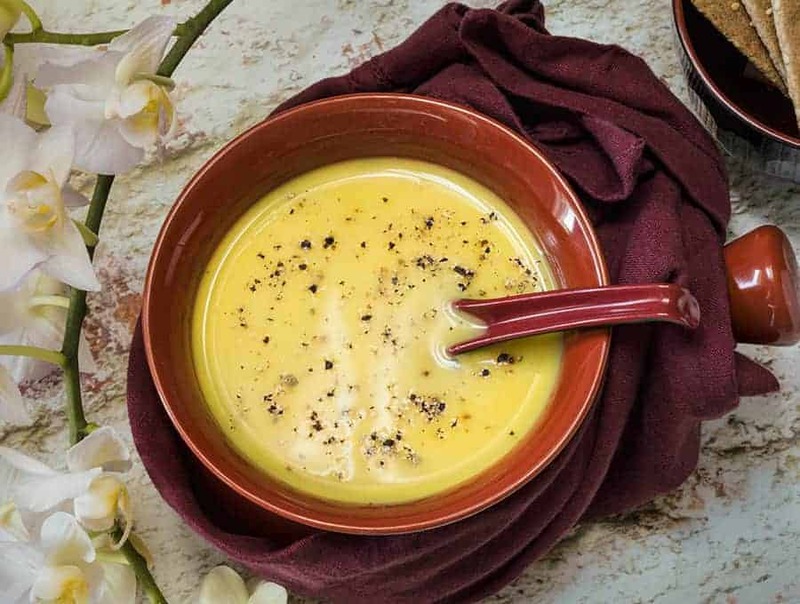 It’s a rich and comforting Indian soup recipe that’s prefect for the colder months! 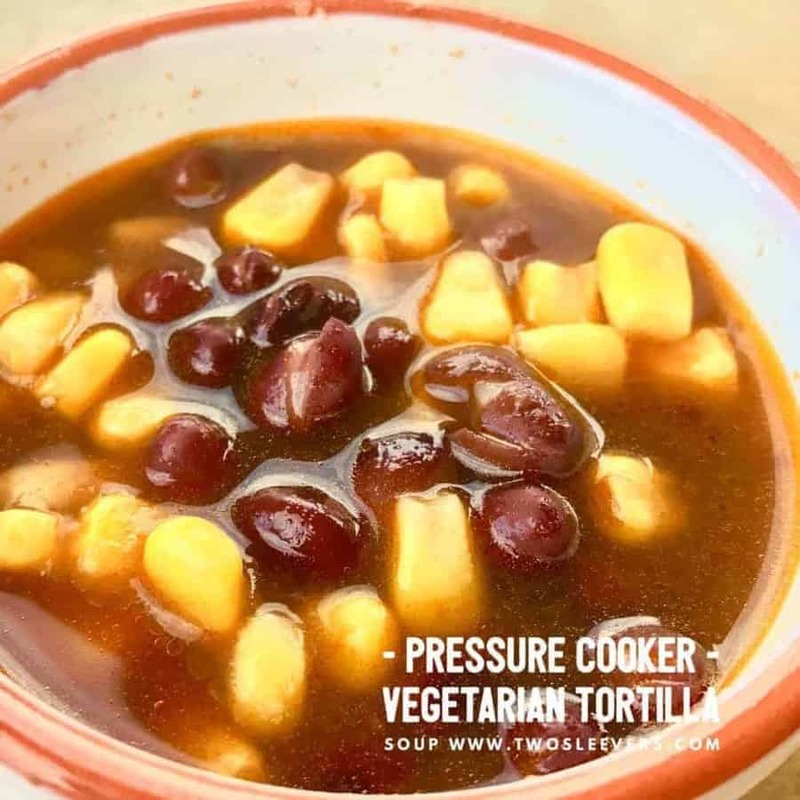 So whether you’re looking for a vegetarian soup dish or just a delicious dish in general, you’re sure to enjoy this Vegetarian Tortilla Soup. It’s quick and easy Instant Pot recipe that’s both flavorful and healthy! 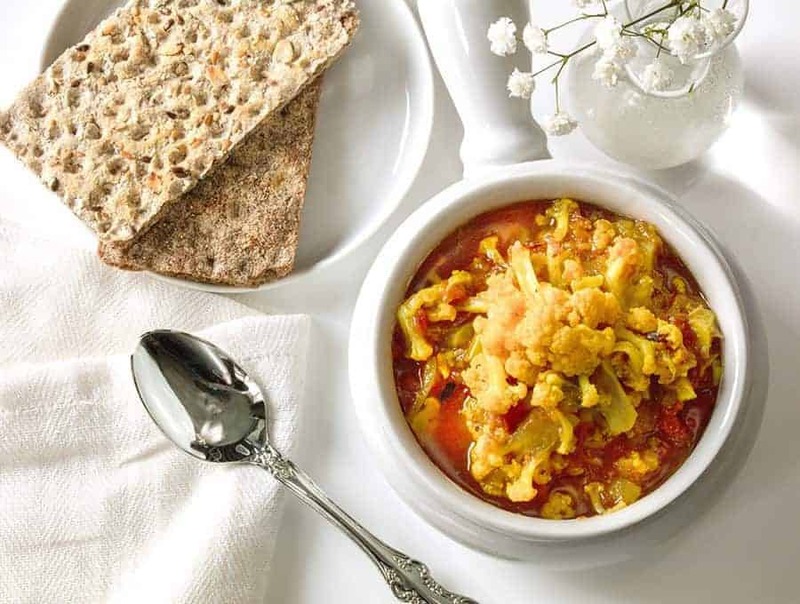 This Vegetarian Tortilla Soup is a delicious vegetarian take on a popular mexican dish. And best of all it's super eays to make! In a blender, blend together onion, tomatoes, garlic, chipotle chili, jalapeno, salt, and cilantro. Turn your electric Instant Pot on to Sauté, for 12 minutes, and when it is hot, add the oil. Once the oil starts shimmering, pour in the blended vegetables and stir well. Keep stirring on and off for 10 minutes until the sauce is relatively thickened. Add in 4 cups of water, and if you're using the corn tortillas to thicken, add them now. Add in the soaked beans, set your Instant Pot to manual, High pressure 25 minutes and let it release pressure naturally when finished. Add in frozen corn and stir to let it heat through, and serve with cheese, slices of avocado, corn tortilla strips or other garnishes. This looks good, but the instructions are missing. Could you put them back in? Thanks for the recipes, they’ve been a big help. Oh really? Thanks for the heads up! I do that. WordPress likes to torture me needlessly.